Editor’s Note: The following is a “forensic” review. We have not yet had the opportunity to test the Ergotron WorkFit-TLE in our labs. When we have been unable to obtain a review unit from the manufacturer and when there is demand from our readers for information on the product, we evaluate publicly available information that the manufacturer and users of the product have provided online. 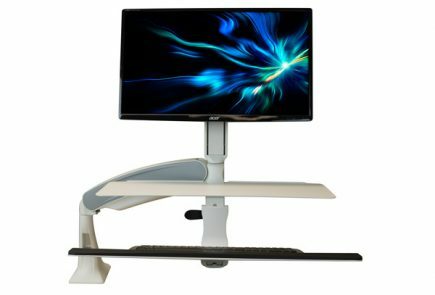 We then apply our extensive experience evaluating standing desks and make an informed projection of how well this product will stack up against other products in its category. As soon as we are able to conduct a hands-on evaluation of the product or learn new information about it, we will update this review. Learn more about our review process at Anatomy of a Review. 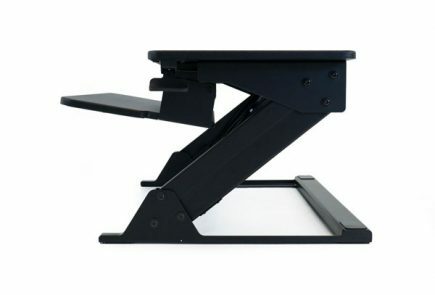 The WorkFit-T is Ergotron’s first Z-Lift standing desk converter. There are other variations in this line, such as a WorkFit Corner and WorkFit-Z Mini. 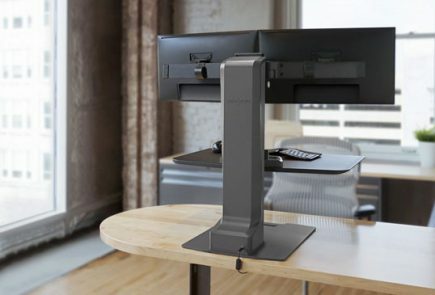 We’ve had mostly positive things to say about Ergotron’s WorkFit line of standing desk converters so far, and our hopes are high for the WorkFit-TLE. Its primary distinguishing feature is a dropped keyboard tray that actually sits below your desk surface while the converter is at its lowest position, mimicking a traditional under-desk keyboard tray. There are positives and negatives to this dropped-tray design. A lower tray is perfect for people with fixed-height desks that are too high to type comfortably at, a problem that can be exacerbated by standing desk converters which usually add over an inch of height with their keyboard trays that rest on top of your desk. The downside will be felt by taller folks who may find the keyboard tray too low in a standing position. Of course, this all assumes that the keyboard tray is stable (we’ve been pleased with Ergotron’s designs in the past, but this is a new ballgame). Stay tuned for a full in-house review of the Ergotron WorkFit-TLE, and be sure to subscribe to our newsletter and stay alerted to the latest updates. 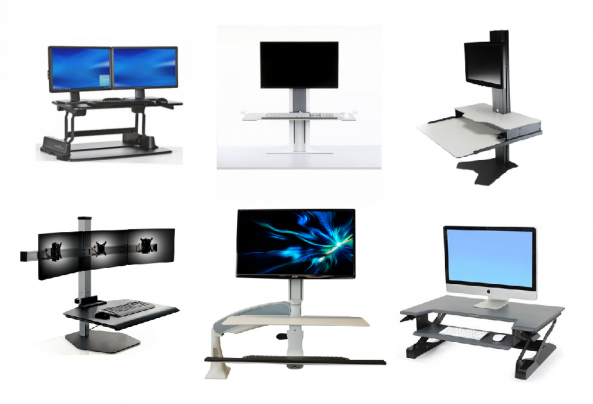 Click here for our comprehensive standing desk converter comparison review.